Now, we know GW was only the beginning for Harris. Not coincidentally, she chose Jan. 21 to announce her candidacy for the presidency of the United States. Her symbolism was that her announcement fell on Dr. Martin Luther King Jr.’s holiday. And not coincidentally, New Jersey Sen. Cory Booker, the man who channeled his inner “Spartacus moment” during the Brett Kavanaugh U.S. Supreme Court hearings and espoused “radical empathy” as part of his campaign platform, announced his presidential candidacy on Feb. 1. His symbolism was that of the first day of Black History Month. Harris broke the CNN-o-Meter on Jan. 28 in Iowa when she appeared during a town-hall meeting with anchorman Jake Tapper. CNN’s ratings with Harris were 75 percent higher than usual for the network’s 10 p.m. EST slot. And the under-35 crowd tuned in at almost quadruple the normal viewership — 186,000 to the usual 50,000 in CNN’s 10 p.m. hour. OK, so what else do we know about Kamala Harris? —She is the child of an Asian Indian mother and black Jamaican father, both of whom were immigrants. —She emanates energy and charisma. Some have labeled Harris and Booker as Barack Obama copycats. Obama Lite, if you will. That Obama comparison could be both a blessing and a curse. Notice both Harris and Booker rushed in warp-speed form to condemn Virginia Gov. Ralph Northam, a fellow Democrat embroiled in a bizarre blackface/Ku Klux Klan controversy. Yes, Obama won two terms as the first black president, but many black folk feel he came up short on TRULY helping them in a practical sense. As opposed to simply being a symbolic, uplifting story as a presidential pioneer. That means Harris and Booker have to do more. Harris danced to rapper Tupac Shakur’s “California Love” during the walk-up to the dais from behind the curtains at her GW event. Yes, that book night on GW’s campus was fun and festive. But there is a serious, lingering question with Harris: Is she overdoing the black culture routine simply to gain racial identity points with folk of color who may view her through the lens of skepticism? 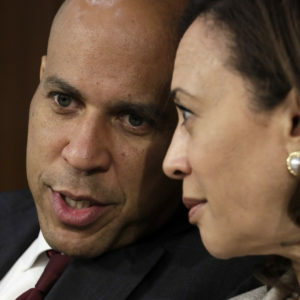 Will that routine provide her with cover/overcompensation to deflect said skeptics Because you have to figure Harris knows that probable black voters may have at least one possible point of contention with her: Her husband is white. Douglas Emhoff is a 54-year-old accomplished attorney from the University of Southern California Law School who specializes in entertainment and intellectual property law in California and the District of Columbia. They met on a blind date and have been married for four years. Why do we broach the subject of her interracial marriage? Because Obama also was a biracial candidate, just as Harris. But Obama was married to a brown-skinned, earth-toned woman. And you better believe that union endeared him to many black folk, especially among black women. That is to say, for Obama, it’s no way in hell that he would have garnered 95 percent of the black vote if he had been married to a blond, blue-eyed white woman. How all of these symbolic issues play out ultimately is up to the 2020 voters, especially those from the black side of town.